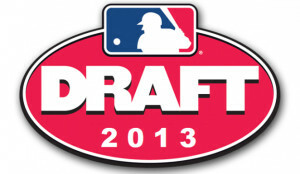 The 2013 MLB First-Year Player Draft is almost one month in the past, as some of the game’s future top prospects continue to sign with their respective new teams and make their professional debuts across the country in various rookie, short-season, and low-A leagues. Although the majority of this year’s draft prospects are less than two weeks into their professional careers, it is always fun to check in, observe, and assess how each player is fairing with their new team. We have done exactly that, as each of the draft picks that were selected in the first round of this year’s draft that have signed and commenced their professional career are listed below and given an assessment of their performance thus far and their projections for the future. In five games with the Arizona League Indians, Frazier has started off his professional career in impressive fashion. The fifth-overall pick and Georgia high school product homered in his first pro at-bat, a solo shot that would highlight a 2-for-5 performance that included four RBI and a triple. Frazier possesses tremendous bat speed and can easily get the bat on the ball with quick, strong hands. He has great power potential and projects to be an all-around athletic, toolsy player at the next level. As was expected by scouts heading into the draft, Dozier has played the majority of his time with Idaho Falls at third, interchanging between the hot corner and his primary college slot at short. Although the Royals raised a few eyebrows on draft day by taking Dozier with their first pick, they may have walked away with one of the bigger steals of the draft as Dozier offers a very underrated arsenal highlighted by a powerful bat and a large, lofty upside in terms of offense. Although he has not showcased much of the talents that earned him a first-round selection in his first week in professional ball, Smith has plenty of time to display his skills. Smith was touted as the premier first baseman heading into the draft and has every reason to hold that distinction. He brings a lot to the table, possessing excellent bat speed and the ability to hit for both power and average, something young prospects and even seasoned veterans struggle to balance. Smith also wields a mean glove at first, which only makes his stock more valuable at the corner infield slot. Peterson appears to have transitioned well to the minors, as he has continued his power-hitting ways with Everett, having slugged three homers and drove in 13 runs in just 11 games thus far in his professional debut. He is a smart hitter and can drive the ball to all fields (and out of it). If you make a mistake in the strike zone, Peterson will punish you as he controls the zone with authority and can put the bat on the ball quickly. He projects to be a quick mover throughout the minors and based on what we’ve witnessed thus far, that assessment may be very accurate.